Kathy Dawson Books, 9780803739758, 373pp. When Alice's father goes down in a shipwreck, she is sent to live with her uncle Geryon--an uncle she's never heard of and knows nothing about. He lives in an enormous manor with a massive library that is off-limits to Alice. But then she meets a talking cat. And even for a rule-follower, when a talking cat sneaks you into a forbidden library and introduces you to an arrogant boy who dares you to open a book, it's hard to resist. Especially if you're a reader to begin with. Soon Alice finds herself INSIDE the book, and the only way out is to defeat the creature imprisoned within. It seems her uncle is more than he says he is. But then so is Alice. Django Wexler is the author of The Thousand Names. He lives near Seattle, Washington. "Working in the grand tradition of children's fantasy, Wexler's off to a promising start." "Will gratify book lovers and fantasy experts alike." 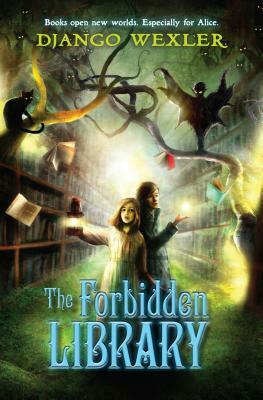 "Fans of Harry Potter and Cornelia Funke's Inkheart (2003) will relish that the library houses magical books . . . It's a joy to watch the dutiful Alice develop her innate curiosity and become a proactive, resourceful heroine, matching wits with snarky cats, dangerous beasts, and a certain smug boy. This is a charming, adventuresome fantasy from a promising new author." "Reminiscent of Cornelia Funke's Inkheart (Scholastic, 2003) and Neil Gaiman's Coraline (HarperCollins, 2002). Wexler ingeniously creates an inventive world with interesting creatures and frightening situations."